A loan of $10,000 helped fund a larger oven and employees to expand our bread production across Hawai'i Island. My father left this earth around my 14th birthday. That experience had a profound effect on my journey in life to the present day. I have always carried with me a sense of pride for my family name, which is why I chose to name my first company, Moody's. I was taught discipline, hard work, and how to provide for myself at a very young age. My father was always pushing me to dream of business ideas as a young child, to break through the barriers holding me from success because of the financial background I was born into. He was an innovator himself always coming up with new ways to fix things and excelling with electronics. The Moody name carries with it the essence of quality and innovation, and I enjoy working tirelessly to live up to the name that I was given. After launching my 1st business over a year ago, I have experienced what it means to stand on my own two feet, your motion being fueled only by the movement you create. It has been tough, exciting, challenging, and rewarding. Now that I have the comfort of my first years experience on my side I am confident that the coming years will continue to give me joy and lessons that make me a stronger and more resilient person. It helps a female entrepreneur meet the growing demand for her bread by hiring another baker, optimizing her delivery processes, and improving her packaging. 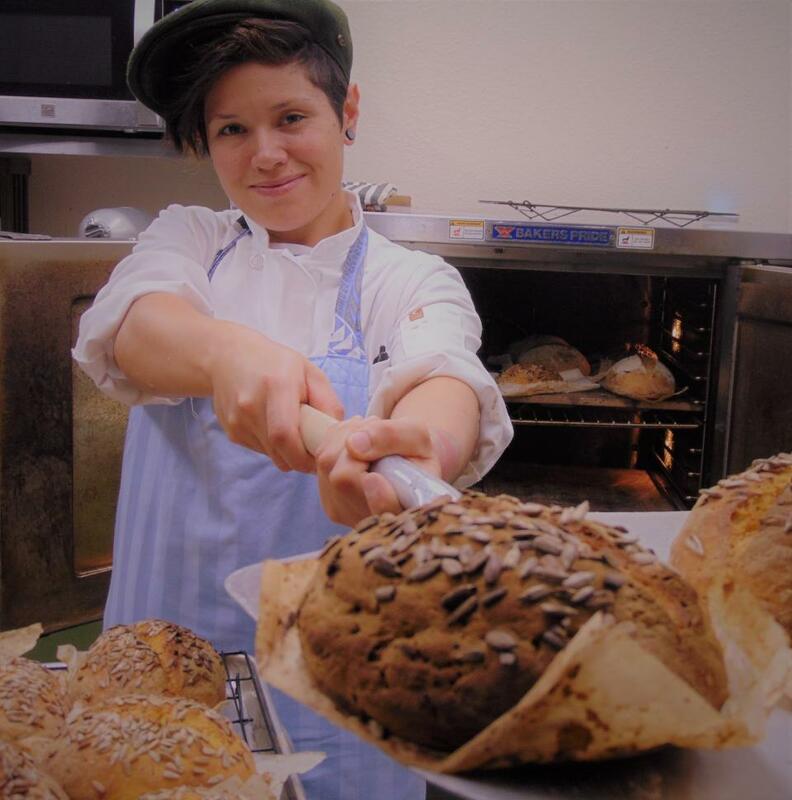 Moody's Artisan Bakery was born out of a need to have quality alternative grain breads that maintain the traditional methods of being fermented and free of dairy or eggs. The aim has always been to create artisan free form loaves that were inherently gluten free and hand crafted. Our focus is on creating a niche that houses innovative bakers who are not afraid to break through convention and create new products that are relevant to our modern day diets and consumer interests. After operating out of a grocery market for the past year, the greatest challenge has been meeting demand as a single baker working out of a kitchen with limited space. Although a Farmers Market Assistant has been added to the roster, clearly the need for an additional skilled baker is of utmost importance to the continuity of providing bread locally. My goal with Moody's is to ultimately operate from a shop-base that provides a full menu as well as daily baked gluten free pastries and breads, which evidently is highly sought after in our community. This would allow us to provide gluten free breads island wide, as well as expanding our Farmers Market menu to include breakfast for weekend market goers. I am most proud of this company for standing for quality, innovation, and creativity. Without the support of artisan bread lovers, the platform for experimentation would have failed long ago, so for that I am equally enthused by my community and am grateful to serve this niche in my capacity as a Baker. The purpose of this Kiva loan will be to hire on a baker, build shelving units that natural food markets can house deliveries in, and also pay for bread packaging. The additional money will go towards new equipment for the farmers market to begin a breakfast operation as well as helping host the first few beach cleanups with any additional funds. Why are you endorsing Mary? We met Mary through The Kohala Center, a valued community partner that engages in rural economic development and consulting to young farm and food businesses on the Big Island of Hawaii. Mary's business, Moody's Bakery, has been operating for a year and is known to the small rural community where she lives and produces her gluten free baked goods. Mary has spoken with us at length about her plans for expansion and we think she has a winner. She and her life partner are known for their enthusiasm for reinvigorating local and regenerative agriculture and healthy food and Mary brings this passion to her business. Locally produced food sells very well in Hawaii and is in very limited supply so we believe there is great potential for Moody's Bakery to grow and succeed on the island, especially with the additional focus on gluten free baked goods.